Conrad Dubai delivers on the promise to offer the greatest luxury; the Luxury of Being Yourself. A stylish haven in the heart of cosmopolitan Dubai, the property is five minutes from many of the city’s attractions, including The Dubai Mall, Dubai World Trade Centre, and a mere ten minutes from Dubai International Airport. The 555-room property features locally inspired and internationally designed rooms overlooking the Arabian Peninsula or urban views of the city. 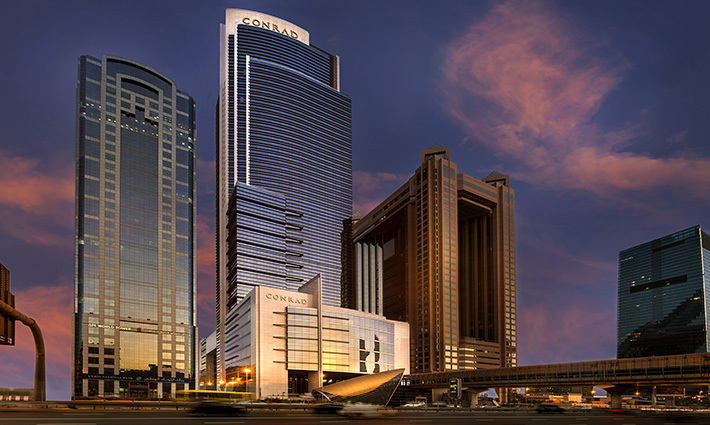 Conrad Dubai is also home to six unique dining and nightlife entertainment concepts. IZEL’s dramatic settings are a perfect backdrop for relishing the best of Latin America’s love of life, while Marco Pierre White Grill, delivers beautifully cooked meals in intimate surroundings with a live piano performance playing in the background. Enter the alcoves of the best wine estates from old to new world at Cave, Parisian bistro and wine bar, or relax on the perfect chic respite around an elevated pool surrounded by beautifully landscaped lush gardens at Purobeach Urban Oasis. Ballarò is top choice for international favorites, or Suga for butler style service cocktail lounge.